You can help us with our wildlife rescue efforts by buying one of our Wildlife Rescue South Coast Calendars! All of the calendar photos were taken by Wildlife Rescue South Coast members to help raise funds for the sick, injured and orphaned wildlife that will come into our care in the months ahead. The majority of photos featured in the calendar are of wildlife that were or still are in Wildlife Rescue South Coast care, and every day has a large, clear area so you can note down those important dates. 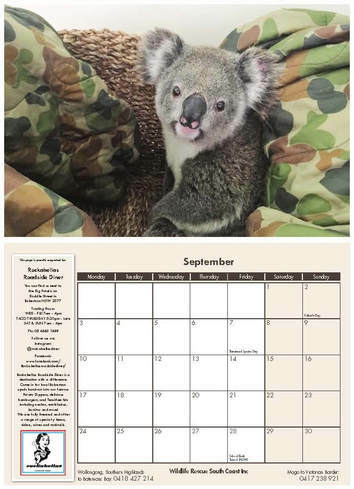 Our calendar is the perfect present and all profits go directly to Wildlife Rescue South Coast Inc., so please buy it today and help us help wildlife. It really is "the gift that gives twice." Note: When you click on the "Buy Now" button you will be transferred to the payment page. Be sure to check the number of items you want, and click on "Update" to see the postage charges.